It was a timpano weekend; just a few relaxed days and a nice meal with visiting friends. For those who have missed Stanley Tucci’s movie, The Big Night, the glorious timpano could be considered one of the cast of colorful characters in this heartfelt food tale. Two brothers go all out with one final feast in a last ditch effort to save their failing Italian restaurant. 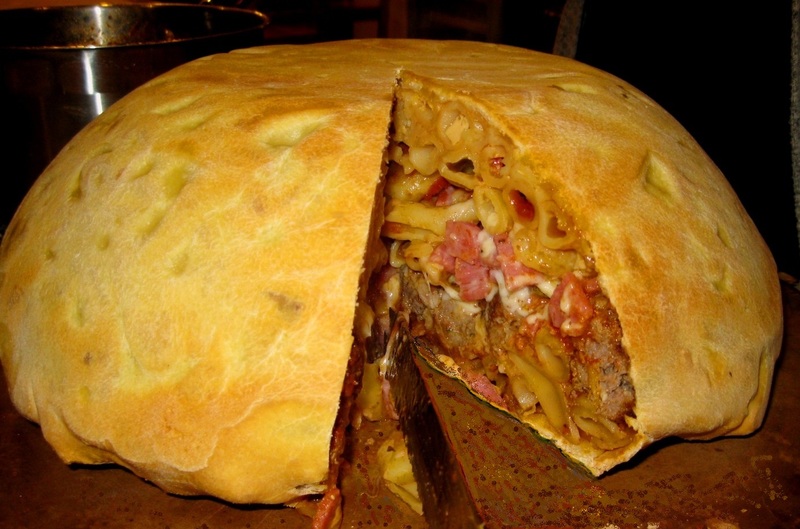 The timpano, a traditional Italian dish revered back in the brothers’ hometown, is a mammoth “pie” of sorts named after the large drum-like pan it is assembled and baked in. The outer crust is a layer of pasta which bakes into a tender-crisp envelope that seals layers of ziti bound with ragu along with cubes of Genoa salami and sharp Provolone cheese, wedges of hard-cooked egg, small savory meatballs and a dusting of grated pecorino Romano. The idea of using pasta dough for a crust was a bit daunting at first, but once launched, we found it definitely inspired. The dough is easy to work, quite malleable, and certainly the right agent to stand-up to the task of holding an enormous quantity of food without falling apart or becoming soggy. Bread or pie dough would have been unnecessary additions in this mélange of rich and robust heavyweights. Tucci offers the entire recipe in his cookbook, The Tucci Cookbook, and it is well worth checking out. The ragu is not to be missed and surely the backbone of this monument. Tomatoes simmer with chunks of beef and country-style spareribs into a flavorful sauce that creates the essential component upon which all other ingredients will later support and complement. At service, the meats and remaining sauce are served on the side as an additional accompaniment. We broke this project down into a set of specific tasks. A couple of days ahead, we started the sauce, allowed it to cool, and then refrigerated it. The meatballs and hard-cooked eggs were made the following day. Cubing and grating were done prior as well. When it came to pulling it all together, we mixed the dough in our standing mixer and proceeded to roll it out. Instead of one huge timpano, we opted to use two smaller 13” metal mixing bowls for our pans. We agreed it made the challenge of assembling the humungous timpano far more manageable. Given our best efforts, one timpano was far more than 7 of us could possibly polish off in one sitting. We didn’t even cut into the second one, and froze it for a later time. 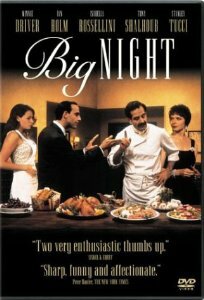 In the movie The Big Night, the timpano is featured as part of an amazing series of courses including a stuffed pig―which leaves everyone literally gasping for air. For our big night, we were utterly undone by a light antipasto, plenty of fresh bread, a lightly dressed green salad, and the glorious timpano. Warm the olive oil in a stew pot set over medium-high heat. Sear beef 10 minutes until brown on all sides and set aside. Add spareribs to pot, sear 10 minutes till brown on all sides, remove and add to beef. Stir in onions and garlic; reduce heat and cook 5 minutes until softened. Stir in wine and scrape bottom of pot. Add tomato paste. Pour ½ cup water into can to rinse and pour into the pot. Cook 2 minutes to warm through. Add tomatoes along 1 cup warm water. Stir in basil and oregano. Cook with lid slightly ajar and simmer 30 minutes. Return meat to pot, along with juices; loosely cover with lid and simmer 2 hours until meat is tender and tomatoes are cooked; stir occasionally. If too thick, add warm water as needed to sauce. Soak dry bread in warm water to cover for about 5 minutes, until bread softens. In another bowl, combine beef, parsley, garlic, egg, cheese, salt and pepper; using hands mix well. Remove and discard any crust from bread; work this into the meat until well combined and mixture holds together in a soft dough. In large frying pan, over medium-high heat, warm the olive oil. Using ½ tsp. scoop, form ½ inch balls and roll between palms to for balls. As a test, cook 1 meatball browning on all sides, for about 6 minutes. Taste, adjust seasoning and proceed cooking in batches until all are cooked, 6 to 8 minutes, and set aside. For dough, place flour, eggs, salt and olive oil in a stand mixer fitted with a dough hook. Add 3 tbsps. olive oil, the water, 1 tbsp. at a time, up to ½ cup, until mixture come together and forms a ball. Turn dough out onto a lightly floured work surface and knead to make certain it is well blended and supple. Allow to rest 5 minutes. Flatten the dough and dust top with flour and roll it out, flipping and dusting from time to time, until it is 1/16inch thick and it is the desired diameter. Generously butter and oil the timpano baking pan. Fold dough in half, then in half again, to form a triangle, and place it in the pan. Open the dough and arrange it in the pan, gently pressing it against the bottom and the sides, draping the extra dough over the sides, allowing enough to come together and seal the center. Cook the pasta until very al dente, about ½ the normal cooking time; drain it, toss with olive oil and 2 cups ragu. Have the salami, provolone, hard-boiled eggs, meatballs and thinned ragu at room temperature. Distribute 6 cups of the pasta on the bottom of the pompano. Top with 1 cup salami, 1 cup Provolone cheese, 6 hard-boiled eggs, 1 cup meatballs, and 1/3 cup Romano cheese. Pour 2 cups ragu over these ingredients. Top with 6 cups pasta. Top with 1 cup salami, 1 cup provolone, 6 hard-boiled eggs, 1 cup meatballs, and 1/3 cup Romano cheese. Pour 2 cups ragu over these ingredients. Top with 6 cups pasta (the ingredients should be about 1” below rim of pan). Spoon 2 cups ragu over the pasta. Pour beaten eggs over filling. Fold pasta dough over filling to seal completely and trim away and discard any double layers of dough. Bake at 350 degrees for 1 hour, until lightly browned. 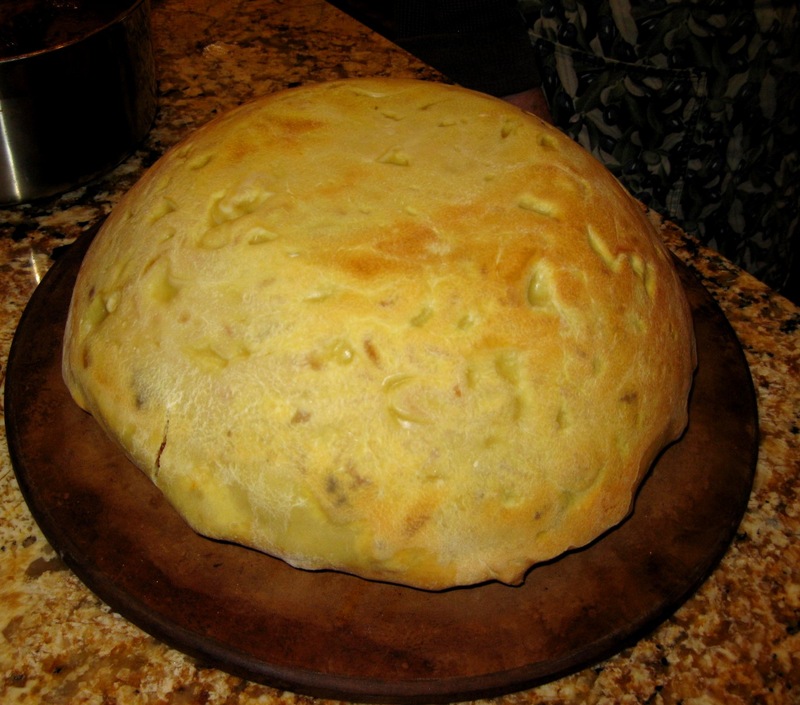 Cover with foil and bake 30 minutes longer, until timpano is golden brown and internal temperature is 120 degrees. Remove from oven and allow to rest at least 30 minutes. The baked timpano should not adhere to pan, but if any part is still attached carefully detach with a knife. Grasp pan firmly and invert timpano onto serving platter. Remove pan and allow to cool another 20 minutes. Using a long, sharp knife, cut a circle about 3 inches in diameter in the center of the timpano, making sure to cut all the way through t the bottom (like cutting a wedding cake). Then slice the timpano as you would a pie into individual portions, leaving the center circle as a support for the remaining pieces. Makes 16 servings. Serve remaining ragu and meats on the side.